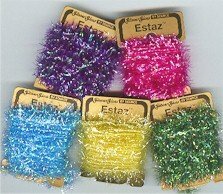 2-1/2 yards per card (Estaz Metallique is 2 yards per card) Yarn is a "garland" type fiber that adds fuzzy accents to your needlework. Use in Couching, Plastic Canvas, Needlepoint, and Cross Stitch. Ideal for mesh size 16, 14, or larger. Use with tapestry needle #22 or #20. 100% nylon.